As many of our readers and members will know , all group content on AmeriCymru was "accidentally" deleted a few weeks ago. The Grwp y Gymraeg was no exception. This was particularly annoying since the group was once the largest and most active on the site including contributions from 133 members. We are in the process of restoring it and we estimate that around 50% of the former content will be in place by the end of the week. More importantly this gives us a chance to explore new directions for the group. 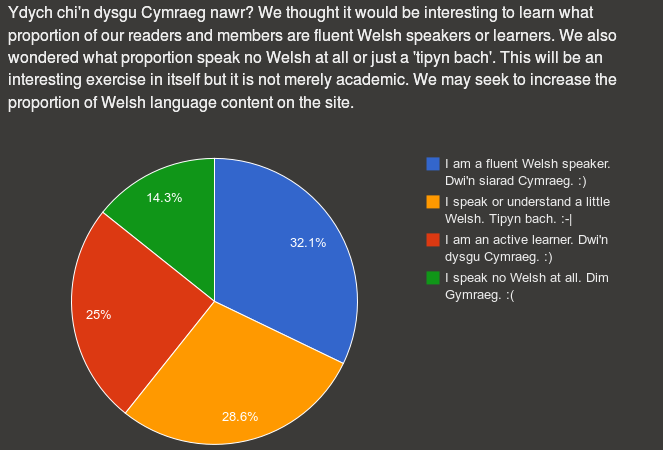 In order to do this we are seeking to establish what proportion of our members are Welsh speakers, active learners or only understand a little Welsh. This will help us enormously in deciding what future direction the group should take. To that end we have launched a poll on our new Community Polls page and we are inviting you to answer one question to help us with our survey. It only takes a second and you needn't log in or provide us with any other information. 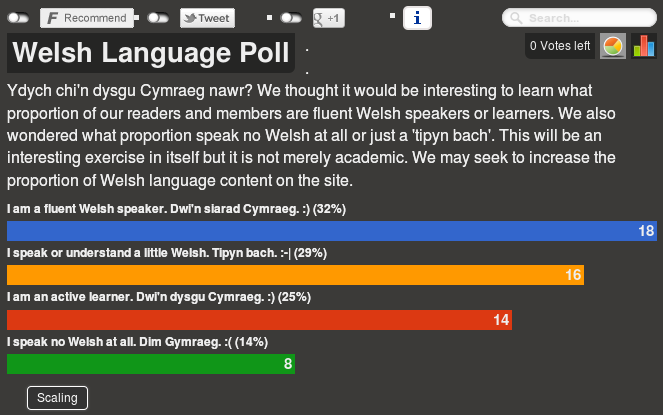 If, as seems likely, from the the results so far (see above graphic) the majority of our members and readers speak or understand at least a little Welsh, we will be looking to increase the quantity and quality of Welsh language content on the site. We already have the excellentWelsh Word & Phrase of the day blogs (diolch Brett Hull) for people who want to learn Welsh slowly and casually. We also have the more intensiveAmeriCymraeg course (diolch John Good) for persons who wish to immerse themselves in full time study of the language. If the poll results indicate a need for it, I propose we use this group to launch a series of ongoing conversations on user contributed topics. The idea would be to add a discussion on e.g. Rugby and allow users to contribute sentences in response to previous entries on a casual basis. This would stimulate interaction and deepen members knowledge of the language at the same time.